In the final stretch of the year, JE DESIGN from Leingarten in Swabia puts the pedal to the metal one more time! 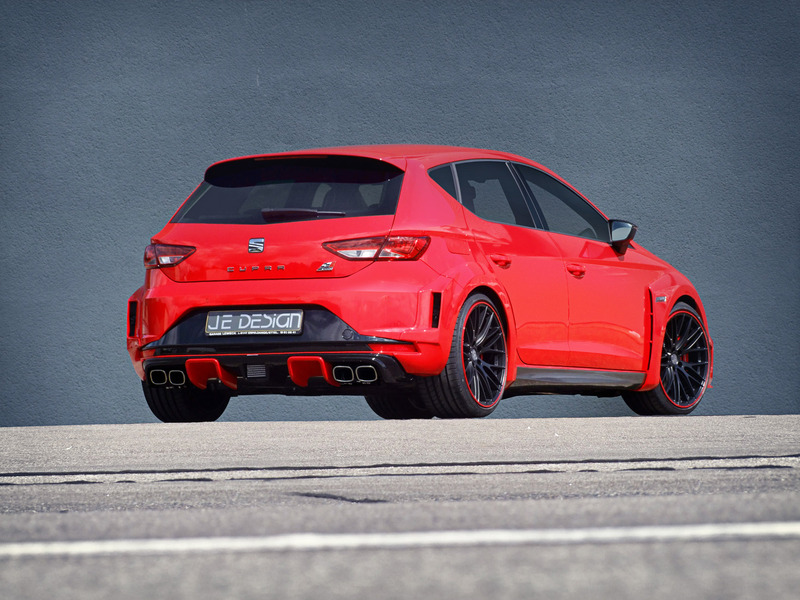 The refiner expands its already extensive program with a wide body kit for the Seat Leon Cupra 5F five-door hatchback as well as with a flap exhaust system carrying an EC approval. 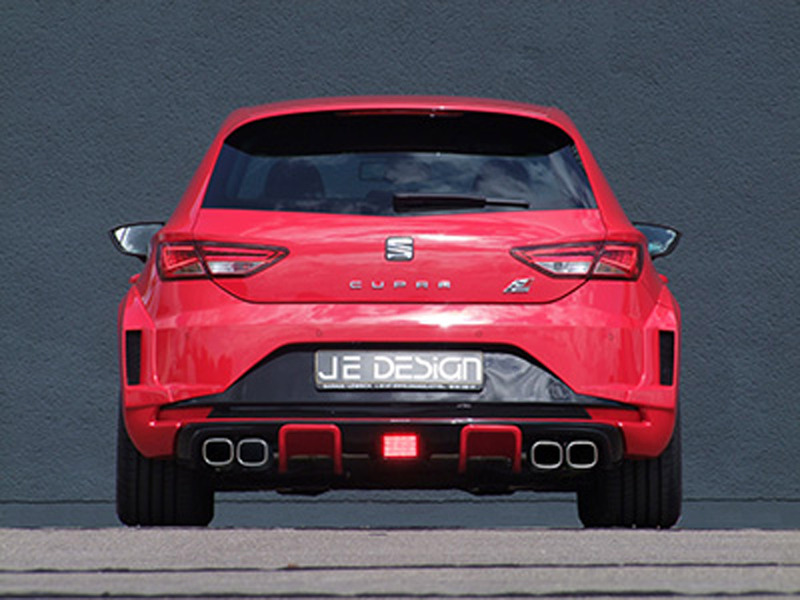 The widebody kit, available for 6,188 Euro, optically transforms the Spanish compact rocket into a real eye-catcher. 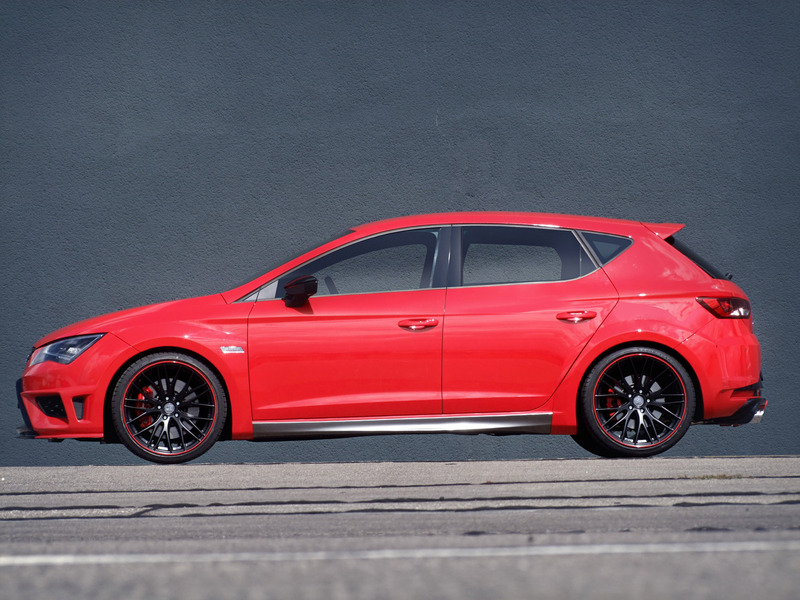 A three-part bumper attachment, massive wheel arch flares front and rear, side skirts in carbon look and a rear apron with two molded diffusers make the family-friendly model into a brute power athlete. 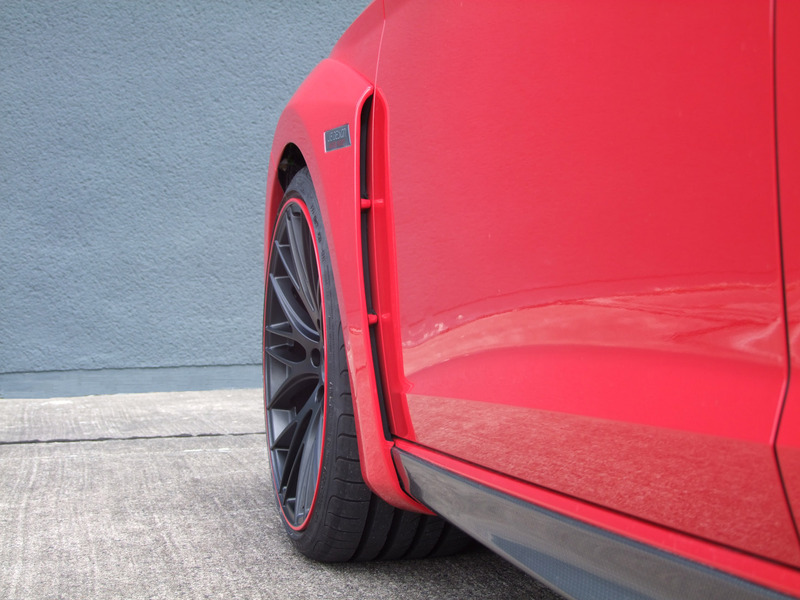 The twin tailpipes integrated in the rear apron with the dimensions 105 x 85 millimeters accent the sporty and aggressive look. 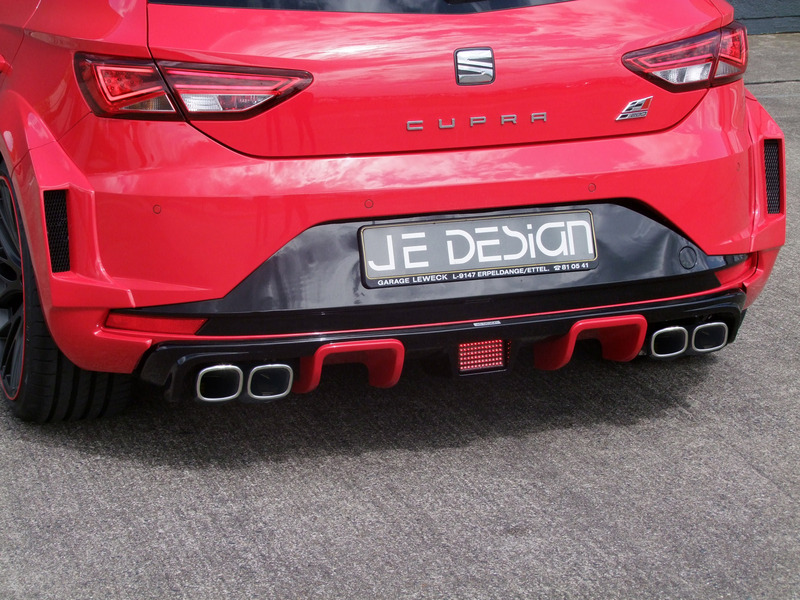 The flap exhaust system available for 2,380 Euro consists of a front silencer replacement pipe, center muffler with exhaust flap and rear muffler with outlet to the left and right. All parts are made of high quality stainless steel. The equipment also includes the Can switching module for the flap control system including a cable set with plug, hose and solenoid valve. 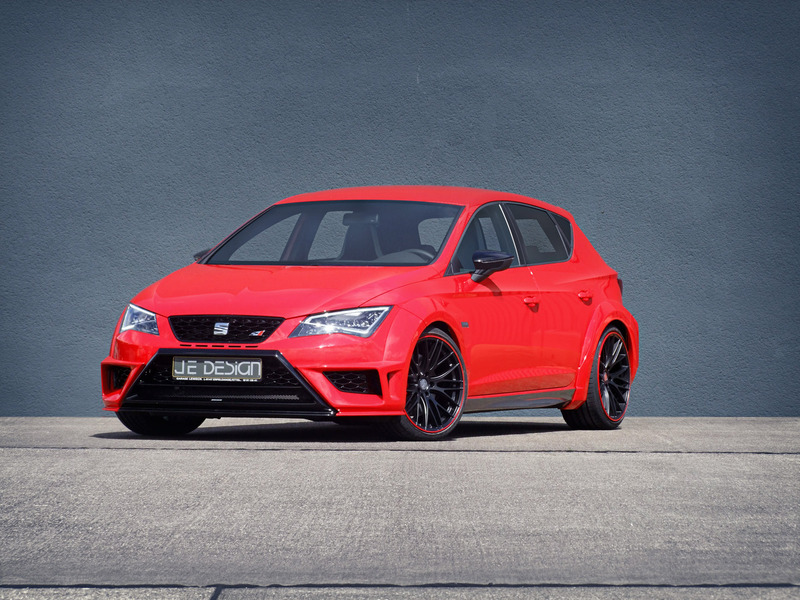 JE DESIGN emphasizes the sporty look with a performance enhancement for the Cupra Widebody. By means of additional electronics, performance increases from 206 kW/280 hp to 258 kW/350 hp with a maximum torque of 440 Nm (380 Nm). 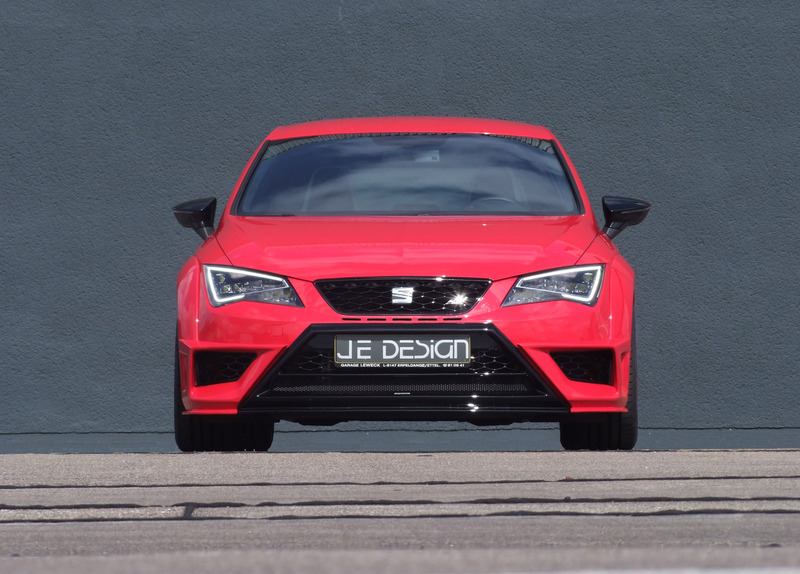 The JE DESIGN Leon Cupra Widebody completes the sprint from zero to 100 in 5.4 seconds while continuing to fulfill the Euro 6 emissions standard. The series model accomplishes this in 5.7 seconds. It doesn't top off until a speed of 250. 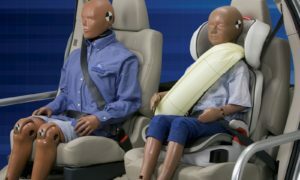 The performance enhancement includes a two-year warranty on engine, driveline and transmission at a price of 2,299 Euro. 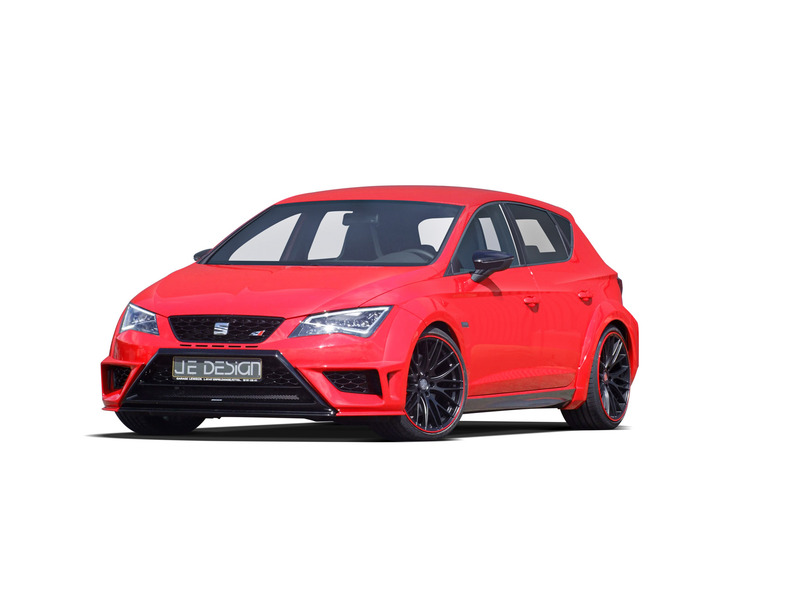 With the KW coilover suspension DCC Plug & Play, JE DESIGN offers an optimal solution for the Cupra, already equipped from the factory with the adaptive DCC (Dynamic Chassis Control). The application, available for 2,299 Euro, brings the fiery Spaniard as much as 45 millimeters closer to the tarmac. The JE DESIGN Y-Spoke wheel set, available in size 9.5 x 19 inches, artfully rounds off the sporty silhouette. Available tires, for example, are the Dunlop Sport Maxx GT in 255/30 R19. The price for the complete wheel set amounts to 2,052 Euro.